The 2016 Draft Nunavut Land Use Plan give complete protection to caribou calving grounds, restricting use of some Inuit land. But a longtime biologist says that might not be a very effective approach. A wildlife biologist with a long history of work on environmental assessments of mines in Nunavut remains unconvinced that total protection of lands now used by caribou will increase their numbers. That was a final reflection from Mike Setterington of EDI Environmental Dynamics Inc., during his presentation at an April 3 session called “Are caribou at risk of extinction and will the Nunavut Land Use Plan save them?,” at last week’s Nunavut Mining Symposium in Iqaluit. While no one disputes that caribou herds are in decline, not everyone agrees with the solution proposed by the Nunavut Planning Commission, whose proposed draft Nunavut Land Use Plan is still undergoing revision. The plan would create widespread protected areas for caribou, some of which covers Inuit-owned lands. This has sparked criticism from the three regional Inuit associations, who say that granting protected status to areas that overlap with Inuit-owned lands interferes with the Inuit right to develop their own lands. The other says that, while disturbances have effect on caribou, it’s still not been demonstrated that these result in a population decline. 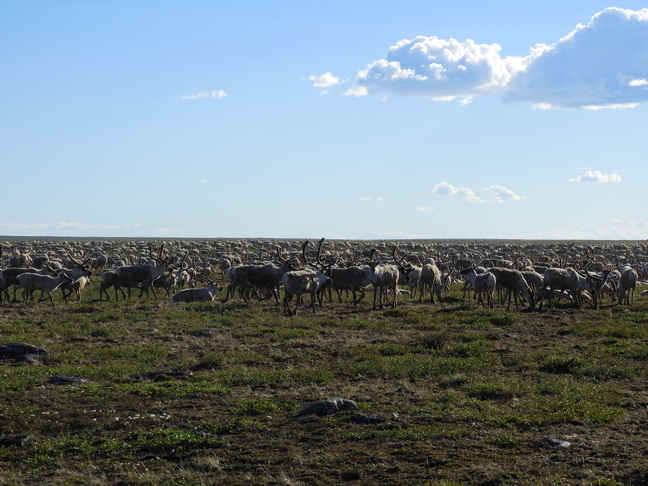 In 2016, the final Draft Nunavut Land Use Plan offered blanket protection for caribou calving grounds. But Setterington pointed out that these can change, and if they’re protected, they could end up being protected “empty space” areas. Inuit in western Nunavut have also maintained that caribou have a history of movement and that the land use plan restrictions would stop mining on their own Inuit-owned lands, which cover about 100,000 square kilometers, even where there are no caribou. But the decline in barrenland caribou is marked: They numbered more than 2 million in the early 1990s. Today the current population of barren-ground caribou is estimated at about 800,000. While most subpopulations have declined dramatically, two have increased, the Porcupine Caribou Herd and the Southhampton Island herd. But several of the largest herds have declined by 80 percent from peak numbers, according to the most recent assessment from COSEWIC. Estimating caribou numbers have always been contentious, Setterington pointed out. The “caribou crisis” dates back to the 1960s and before then, and sparked government imposed restrictions such as prohibiting the use of caribou to feed dog teams and relocating communities away from caribou herds. Science still says disturbances from human activities are responsible for the decline, along with climate changes, overhunting, predation, diseases and insects, while traditional knowledge emphasizes predation, hunting and insects, followed by development, climate change, disease and pollution. Inuit also say caribou move around, so protecting certain areas might miss the mark entirely. Although the land use plan proposes no mineral exploration and production, oil and gas production, quarries, hydro-electric development or all-weather roads be built on caribou calving grounds, Setterington suggested that it could be wiser to focus on protecting critical habitats through ecosystem management, not a complete protection of specific areas. Ecosystem management involves a more integrated approach to protection, by trying to conserve natural resources while meeting socioeconomic, political, and cultural needs. As it stands now, mines cover .006 percent of Nunavut, or about 13,000 hectares, said Setterington, who during his career worked for the Government of Nunavut in Arviat as well as on the caribou section of the environmental impact assessment for the Mary River mine in north Baffin. He’d also like to see authorities provide convincing evidence on a case-by-case basis that protection is the only way of ensuring herd health and that other measures are not working.